Church Closure...we need at little help. Yesterday saw the last Eucharist Service before the church transfers to the village hall, next Saturday we see the last Wedding and Sunday the Last Baptism. At 3.30pm on Sunday 3rd July we need a team of volunteers to assemble at the church to help remove all the loose contents of the Nave and Chancel into the Memorial Chapel where they will be sealed up during the re-roofing works. We could also do with some good sturdy cardboard boxes to store books etc in too. Any help you could give would be most appreciated. At 9am on Monday 4th July the Church will be handed over to the builders. 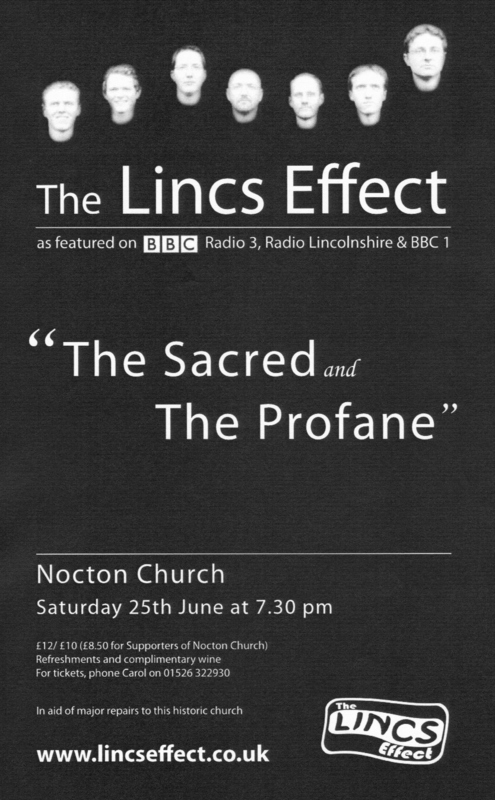 Nocton Church resounded to the enchanting sound of Anglican Choral Music, Oasis, The Beatles and Postman Pat on Saturday as we sat and listened in awe to a fabulous performance by the 'Lincs Effect'. 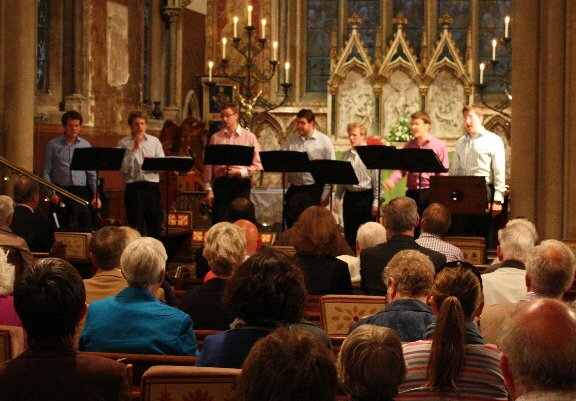 The 7 piece male harmony group made up of Adult Cathedral Choristers, gave us and evening to remember as they toured us through a selection of music in a concert entitled 'The Sacred and The Profane'. Around 85 people attended and enjoyed a glass of wine and finger buffet at the interval. The weather being warm encouraged people to go outside, chat and also look at the last week of the modern Sculpture display. Another great event at Nocton Church. Thanks to Carol Bennett and the fundraising committee for all their hard efforts. The small hiccup of the door locking them out, trying to break in and finally calling out a locksmith 45 mins before concert start is a story also worth the telling. A Great Concert! Great Music! Great Food and we raised £640 towards the roof repairs. Thank you to all who took part, performers and organisers. A great turn out of 25 attended the lecture 'Light in Art' given by Lincolnshire artist, Martin Griffiths, tonight in the church. Martin took us a break neck speed through art from the middle ages to the very modern and analysed the changes of techniques in relation to light and its application in paintings down the ages. The hour flew by and I now hope I have had the door unlocked to enjoy art in a more soulful and meaningful way. Martins sculpture 'Solar 1' which is still outside the church until the end of the month was also a focal point of discussion. On the 30th June Martin is to work with pupils from Nocton Primary as the look at art as part of their curriculum. We've really enjoyed being part of this sculpture tour - Thankyou Martin. Contracts were signed last night for the reroofing project. English Heritage also yesterday agreed the final tile choice, and the builders and interior conservators agreed their joint requirements. I also had a meeting yesterday with Lincolnshire Old Churches Trust in respect of more grant aid. I am very hopeful they will offer a contribution. Final details are now in the hands of our architect, David Glew. Phew.........!! Its been a long slog but we've got there. Thanks to everyone who has helped in anyway whatsoever to this point in time. 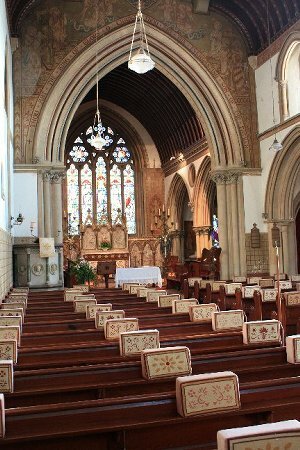 If you wish the team and congregation at All Saints Nocton to Pray for you, a situation, a colleague, relative or anything where you consider prayer an important means of support. Please feel free to use the new link on the blog site navigation bar 'Prayer Request'. If you wish us to pray only privately for you please let us know on the form. We hope you will find this a useful addition to the pastoral and ministerial services we offer in the community. We have now received the the Diocese of Lincoln approval for the works to our church. This is known as a FACULTY and is the authorisation from the Chancellor of the Diocese, His Honour Judge Mark Bishop. This legal authorisation is something that has to be obtained prior to any works inside or outside a building belonging to the Church of England. There are a few of minor conditions stated which will be delegated to our architect David Glew to manage. However everything is on course for a July 4th start as planned. We anticipate signing the contracts at the PCC meeting on Wednesday 15th June. Christian Aid Week - Update. Thanks to everyone who contributed to the Christian Aid Week Collection. We raised a fabulous £328 and I know a number of you contributed directly via Credit Card. Well done again Nocton. Christian Aid monies really do help the most needy. An Update on the Church Roof. Plans are now well advanced to commence the reroofing of the Nave and Chancel. Subject to final permissions and tile selection by English Heritage, the reroofing will start on Monday July 4th. The completion date is now envisaged as the end of January 2012. The work will be completed in two phases with the chancel repairs being completed first then a pause to allow for the bat maternity roost to naturally vacate the building during August. Additionally we have a previously planned wedding on 12th November which we must honour, so the phase two the chancel will start after Miss Polly Hardy has wed. This will ensure there is NO scaffolding visible for photographs. The roofers will then work in earnest throughout December and January to complete the Nave. During this period all church services will take place as normal in Nocton, with the exception being they will be held in the Village Hall (by Bishop Tim's permission). 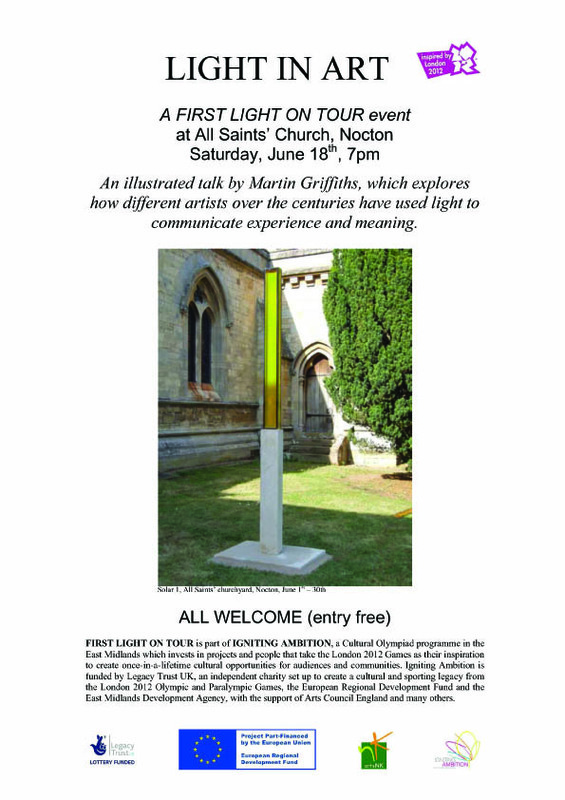 Light in Art - A Lecture by Sculptor, Martin Griffiths. To coincide with the display of Martin's sculpture 'Solar 1' at All Saints during June, there will be a lecture given by Martin in the church on Saturday 18th June starting around 7pm. The title is 'Light in Art' and will be reflection by Martin of the use of light to reflect nature and spirituality in art. Pleased come along, entry is free and refreshments will be available. Come along and enjoy another great Nocton Concert. Contact Carol Bennett 01526 322930 or Ann Kennedy 01526 322739 for tickets. Sue Morris today launched the second book about Nocton put together by herself and Sheila Redshaw 'The Last Years of an Estate Village - Volume Two'. Many people from the village and around the country were invited as contributors, to a hog roast on The Green at 1pm. The book was launched with a cake and speech from Sue at 2pm. At first glance it looks like another good history of Nocton as it was, and is today. The Church was also open for visitors to come have a look around and view the Light Sculpture installed by artist Martin Griffiths. There was a good footfall throughout the afternoon, for viewings, a coffee and cake and some genealogists researching their families. The weather was great and I think we all had a good time.